Last night I noticed that the parody video we made filmed back on Saturday 26th March, CACI & The Irish Census, has been removed from YouTube. 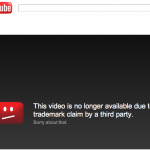 “This video is no longer available due to a trademark claim by a third party. Saturday 26th March 2011. Jannene Roberts takes to the streets of Dublin to reassure the people of Ireland that their census data is safe with CACI. This work is released under the most expansive Creative Commons licence. You may use this work commercially. Please let us know in the comments if you have used it commercially. Otherwise do with it what you please. Please note the addendum contains images garnered from the internet in a “fair use” capacity and as such are excluded from this Creative Commons license. CACI & The Irish Census [a spectacle] by itison.net is licensed under a Creative Commons Attribution-ShareAlike 3.0 Unported License. Based on a work at blip.tv. Permissions beyond the scope of this license may be available at http://itison.net/.